A few weekends ago I took a little trip up I-95 to the lovely state of Vermont. All it took was a few hours of seeing ever so slightly golden leaves for me to shift into autumn overdrive. Pumpkins! Scarves! Bourbon! Then the pinterest manic mode turned real life and there was no turning back. Every baking idea was tinged with a golden ray of nutmeg spice. At the Brattleboro exit around midnight I got the idea for the ultimate fall cookie: maplesnaps. 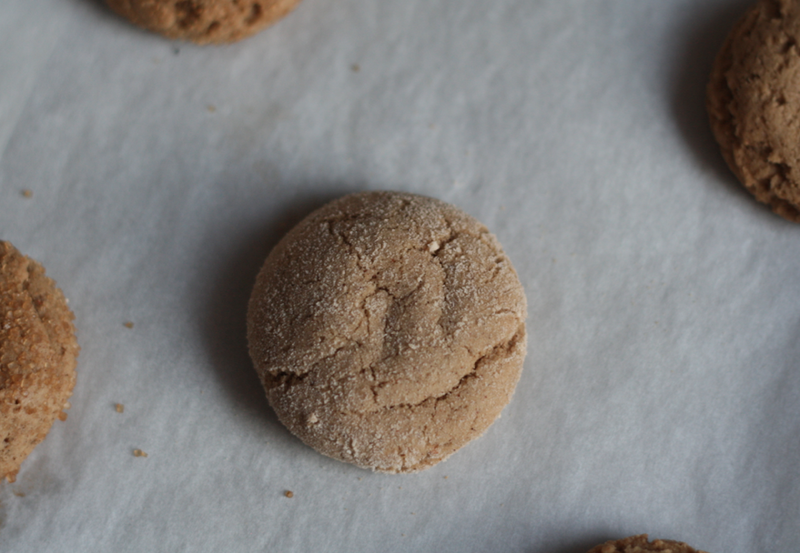 Oh you know, a chewy spiced gingersnap-like cookie but made with pure maple syrup instead of molasses. Then a few select food souvenirs came through to help me out in making it a reality. I picked up a bag of maple sugar for the coating. I spent far too long in what I think may be my ultimate happy place (also known as the King Arthur Flagship store where – among other things – I found an amazing vanilla extract with VANILLA BEAN SEEDS (and a gnome cookie cutter which is patiently waiting for its turn in the cookie line-up). But the moment when I knew my cookie apparition was destiny was when I was given a jar of maple syrup to take home which was harvested from a tree no less than half a mile where I slept. 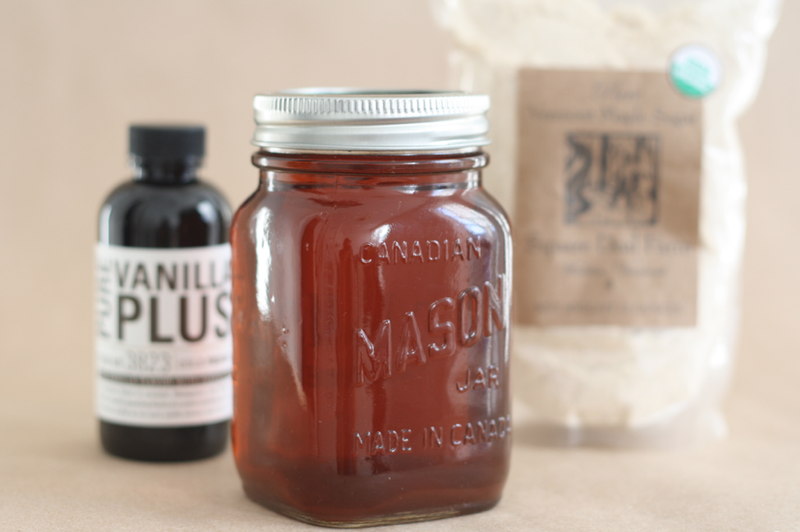 With summer now officially behind us, it is time to re-stock your spice cabinet, get your hands on some pure maple syrup, and get serious about this cold weather business with a batch or two of maplesnaps. Preheat the oven to 350 and line a baking sheet with parchment. In a medium saucepan set over medium heat melt butter – stirring constantly – until it begins to foam. Continue to cook and stir until the foam subsides and milk solids begin to form on the bottom of the pan. Keep a close eye on the pan and turn down the heat if things start to get too toasty. When the butter has deepened in color and smells wonderfully nutty, turn off the heat. Pour the butter (with the bits and all!) into a liquid measuring cup and let cool to room temperature while you measure out the remaining ingredients. You will need 1/4 cup brown butter for this recipe and you should end up with about that amount but if you happen to have a bit more then just spoon off any extra into a small bowl and use for any future butter needs. Whisk together the flour, baking soda, cornstarch, and spices. 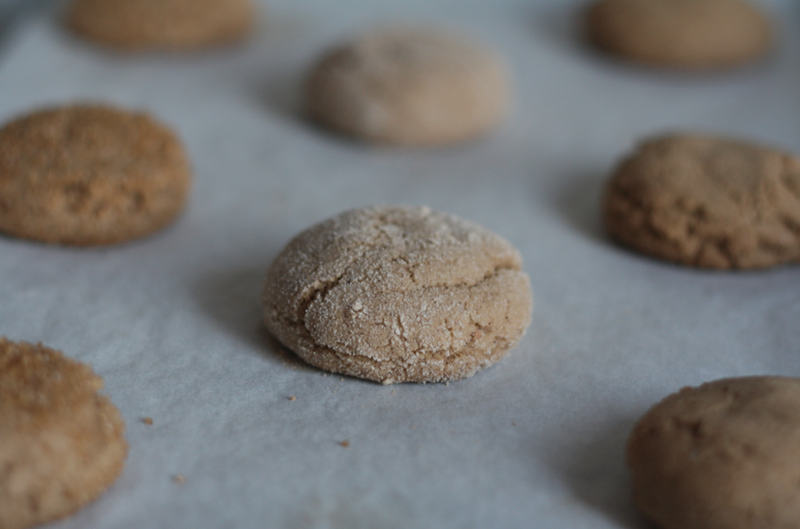 Combine brown sugar, 1/4 cup brown butter (with all those brown butter bits! ), maple syrup and vanilla and mix until smooth. Add egg and stir until combined. Add the dry ingredients and mix until combined and no streaks of flour remain. The mixture may be crumbly. Scoop into balls and roll in maple (or turbinado) sugar. Bake for 10 minutes or until the tops are just beginning to crack. Let the cookies cool on the pan for several minutes before transferring to a wire rack to cool completely. Store in an airtight container at room temperature. *Just a teaspoon makes for an extra chewy cookie! **Don’t have maple sugar? Make your own by combining 1/2 cup superfine sugar (granulated is fine too) with maple syrup, one teaspoon at a time. Use a fork to mix the syrup with the sugar (see other sugar tutorial on homemade brown sugar) and just like that: quick fix maple sugar! These look and sound delicious – Vermont sounds gorgeous. Oh my goodness, fall is here and these are perfect. I’ll need to try these, stat! Fall is the best time for baking. Can’t wait to try these! ps- so jealous of your trip to King Arthur Flour flagship store!!! What would happen if the cornstarch was eliminated? Disaster? Hi! I was wondering why that works. Like, i figure it must have something to do with the thickening power of the stuff, that makes it softer and more cake like.. but how? Hi Isa – Yes, also cornstarch doesn’t have gluten so helps the cookies stay tender! They sound so Autumnal, would I be able to use standard maple syrup as opposed to pure maple syrup? I have a feeling that we may be talking about the same thing :). Standard maple syrup is probably pure maple syrup. The only type of syrup that you want to avoid in this recipe is using one that is commercially-made (for example: Mrs. Butterworth’s syrup) because it is filled with lots of extra sugar, etc. Hope this helps! Happy baking! Um, I need a gnome cookie cutter! I TOTALLY agree. It will set you back $1.50. Also, vanilla and sparkling sugar are must-haves. What’s there not to love about these cookies! Your drive sounds beautiful too! I love Vermont. Can i make this without egg? I am allergic,but don’t know the subs yet. Thanks! These cookies are the perfect company for a crisp fall day.They’re maple and spice flavor is a great way to welcome the beautiful hues of yellows, browns, and reds on all the autumn leaves. Fall is here! How many teaspoons of maple syrup get combined with the super fine sugar? These look perfect for the bake sale I am helping with this weekend. I would start by mixing together 1/2 cup sugar and 1 teaspoon of maple syrup. Add maple syrup 1 teaspoon at a time until the mixture is sandy. 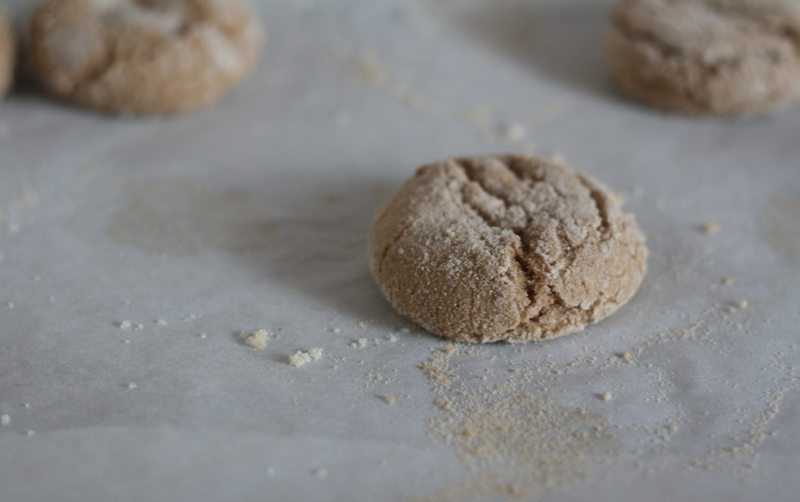 You can roll the cookies at this point OR if you really want to get fancy with your maple sugar, then spread the mixture on a baking sheet until hard and then pulse in a food processor to break down any clumps. 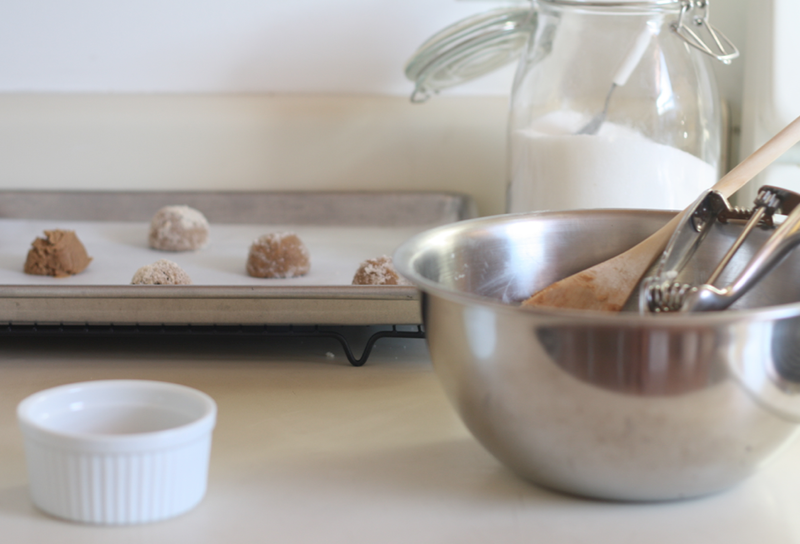 Store your homemade maple sugar in an airtight container. Happy baking! I made these for my children for after school snacks next week, but they only lasted two days. My 11 yr old took one bite and declared them a masterpiece! There is no higher praise than I can think of than that, so I’m putting them on the keeper list. Amazing!! I’m happy to hear they have made the list. 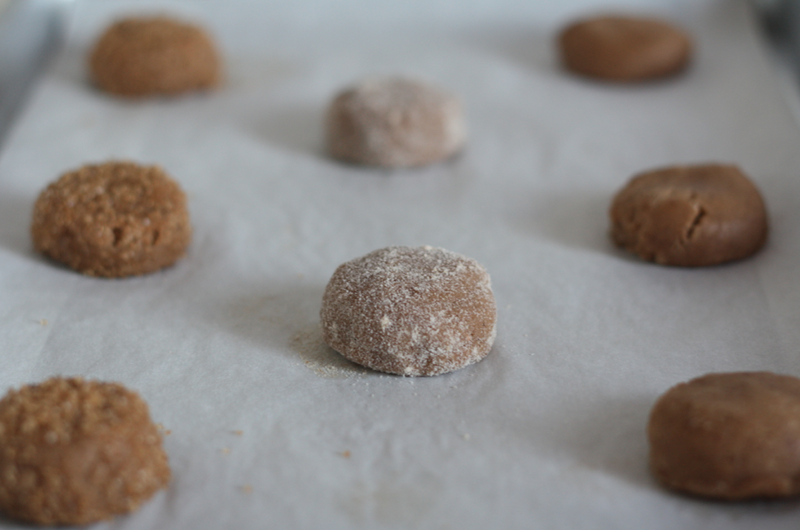 I made a batch of these maple snaps this afternoon and they are so amazing! Slightly crunchy on the outside and chewy on the inside, this is my new favorite cookie! Thank you for sharing all your tips and this wonderful recipe!!!! So happy to hear that Linda – they are some of my favorite new cookies as well! Hey! Just wanted to let you know that I found this recipe post in a search as I was trying to choose a nostalgic item for Thanksgiving today (I’m from CT and living elsewhere for the year). I made these and brought them for the family. They turned out beautiful with the cracked sugared tops and I got great feedback. Thanks! Hi Molly! That is lovely to hear! I’m glad you found them and that they were a hit. Happy baking!